I had an old Oxford Concise Atlas, which I managed to get from a library for one euro a few years ago. It was a library where we used to live in Co. Kildare and each week they sold off older books as they were replacing with new. (Co. Carlow libraries don't seem to have that level of funding!). 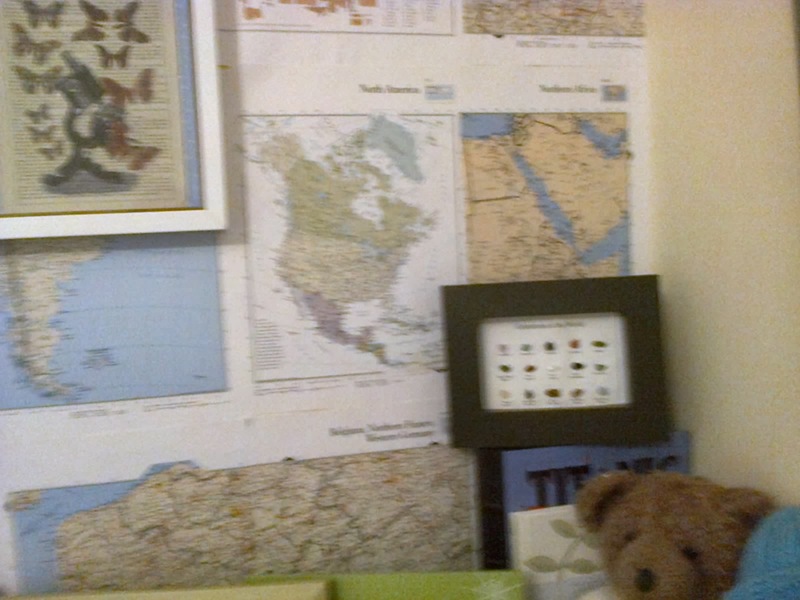 The atlas was an old reference book and barely read so perfect for the map wall. I had no plan for the layout when I started. I mixed up the continents and the colours. I added to the wall using my miracle double sided sticky tape. I had to give up a few times as himself thought it would be a great idea if he came up the ladder too! Delighted with the result, total cost was 4euro. This is a little mix of pictures I rearranged for over his bed. The teddy bear frame was a charity shop find and I repainted the frame on it before. The airplanes picture is a piece of fabric in an embroidery hoop (have cushions in this fabric for sale in my etsy shop). 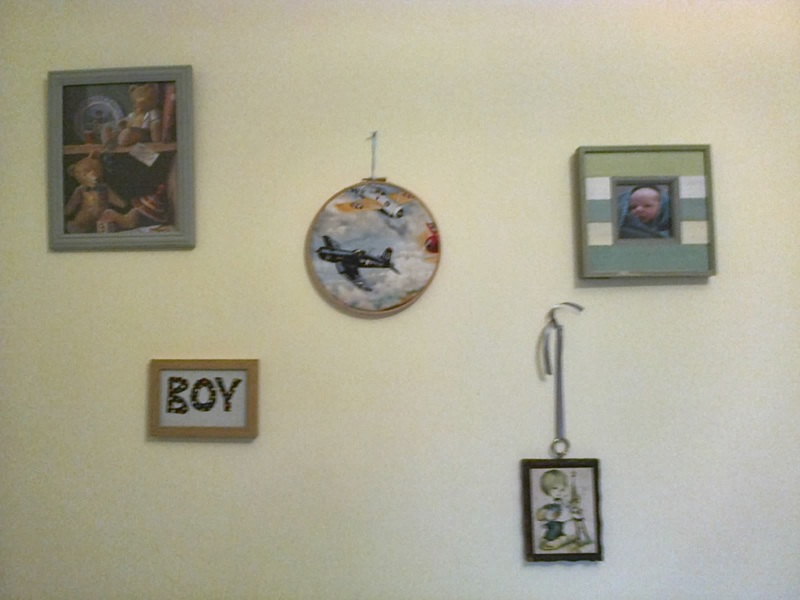 The "Boy" frame I made and the little picture on the bottom right was from a bargain bin in the antiques fair, cleaned up and added a ribbon. 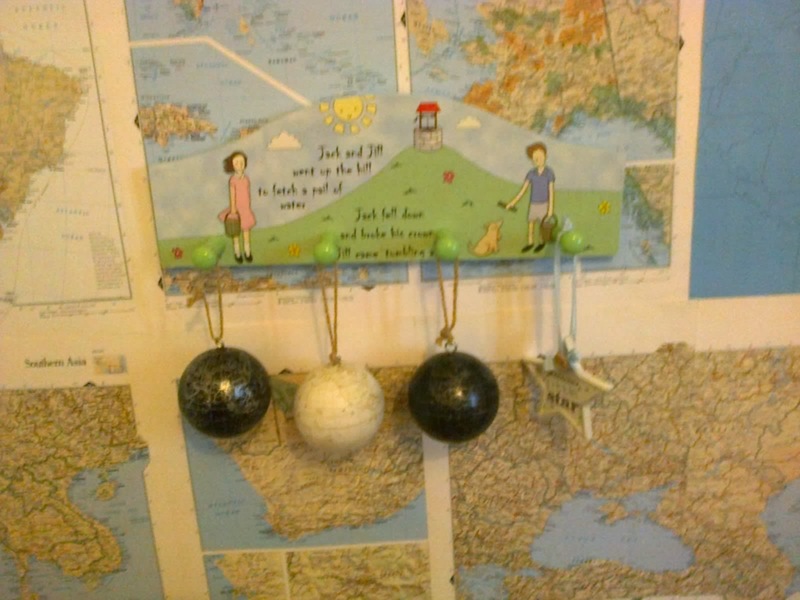 These globes were Christmas decorations I spotted in TK Maxx and I thought they would be great in one of the boys rooms and not on the tree at all. I might attached them to the wall later on. Very blurry pic, sorry! The butterfly picture is from "Forgotten Pages" on etsy and the frame over the teddies head is actual "gemstones of the world". My late father had this and it is all tiny samples of different stones, I think it fits in perfectly with the new wall and I love that this and the teddy below where things my dad bought. Another blurry shot!!! 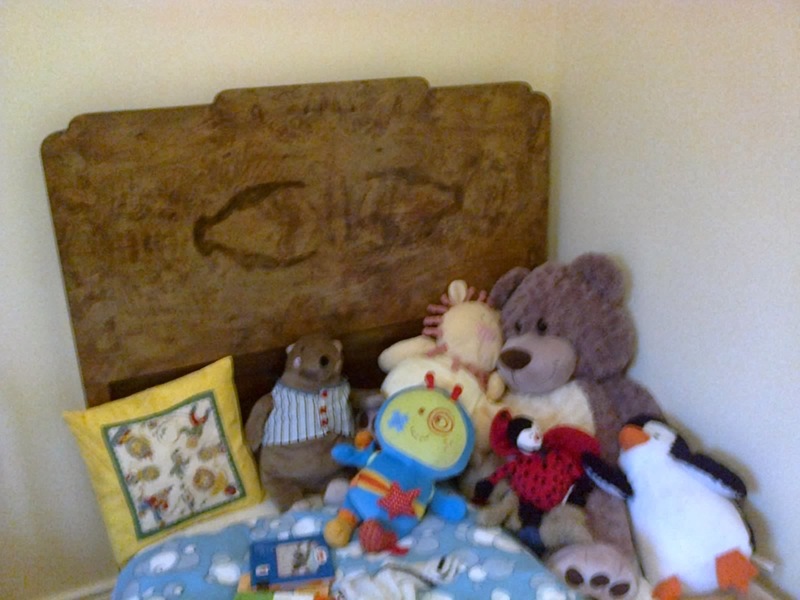 This will be smallest one's bed when he moves out of his cot, its a 1940's bed-frame which has had a new base added. I need to change the curtains and bunting next. Now to figure out what to do in my daughter's room! Thank you even though I can't claim it was my original idea!! I would love to get a globe too, I've been looking forever for the right one. Thanks Nicole! We did away with an attic space so we could have the higher ceilings in the bedrooms so they all have little curves or shapes, not good for hanging blinds though!! Yes highly recommend double sided tape. Thank you Eve and for stopping by! Sunshine today again! Get those sun glasses ready I'd say! :) Beautiful ideas and great result! 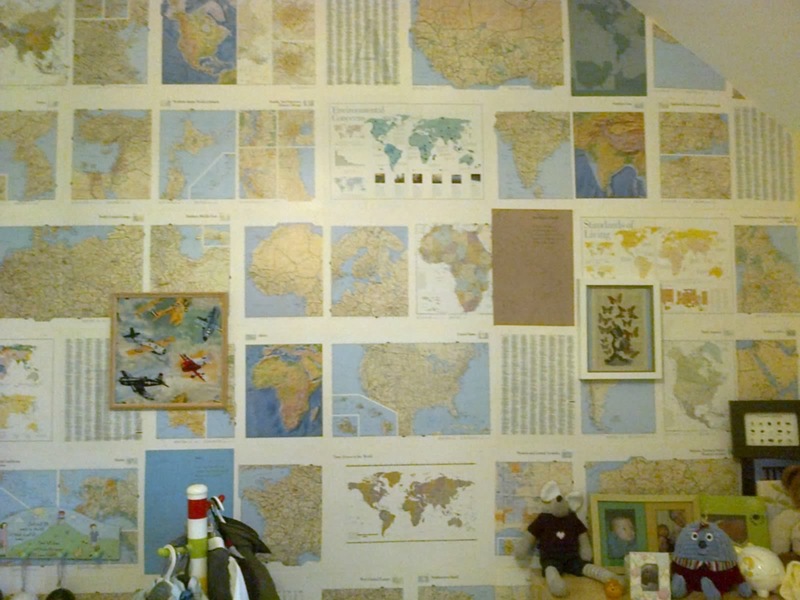 What a lovely room, I would have loved looking at all those maps and dreaming of where I wanted to go when I was little, I'm sure your boy will too! Thank you, problem is now I am dreaming of where to go instead of him!!! I shall have to check out your new blog now. 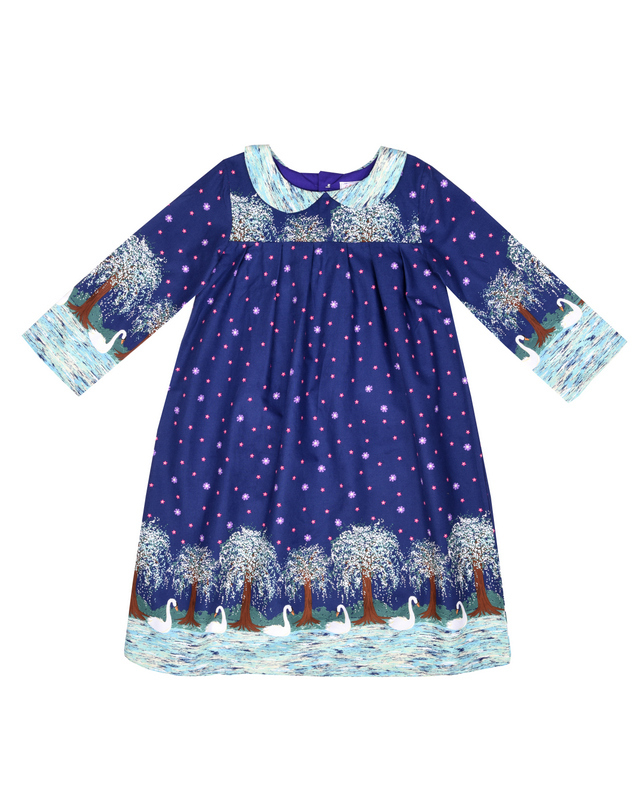 Happy sunny days..they are coming soon ! Wouldn't that be a fab quilt! Now I am thinking about one too. you're so creative. Inspiring post!